Ever had a hankering to sleep in a wine cask, or swim in an underground pool with a medieval vaulted ceiling? Hotel experiences in the Netherlands run from the royally posh to the painfully hip, with plenty of stunning modern design and quirky details to catch your eye. 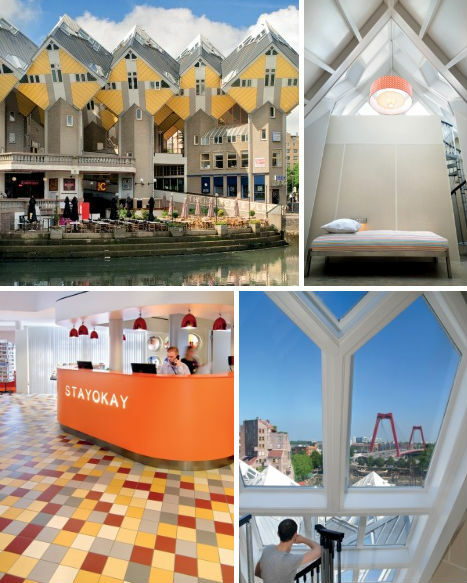 Whether you’re headed to Amsterdam – the unofficial party capital of Europe – or the peaceful tulip-covered countryside of Holland, these 14 hotels, hostels and inns will make you feel at home. 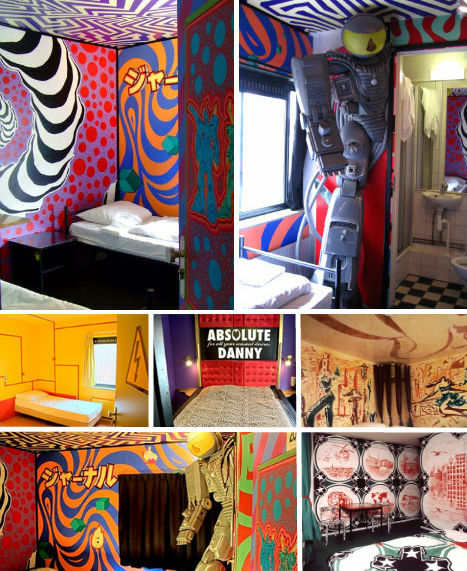 The Winston calls itself an “interactive museum of modern art”, where every room has its own quirky theme, the hallways are packed with paintings and even the bathrooms function as galleries. 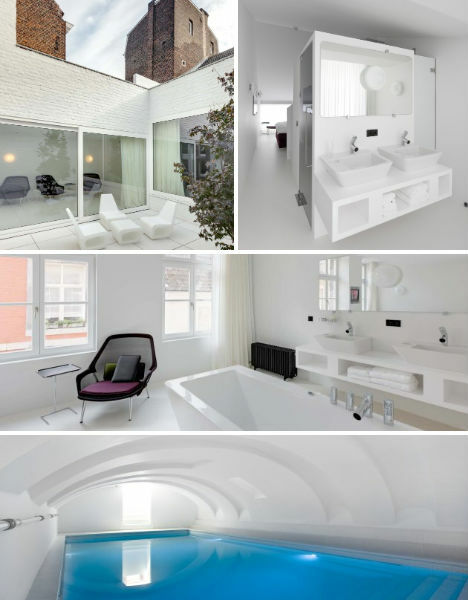 A budget hotel/hostel in the red light district, The Winston is vibrant and youthful. 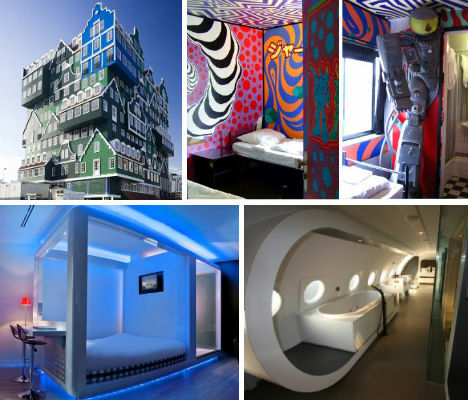 Guests can choose from eye-popping neon rooms with robot sculptures hanging from the wall, or tamer black-and-white rooms filled with photography. In addition to the hotel’s restaurant and bar, there’s a private beer garden overlooking the red light alleyways and an ‘infamous’ nightclub right next door called Winston Kingdom. Despite the name, there’s nothing controversial about the trams-turned-guest-suites at the Controversy Tram Inn in Hoogwoud. 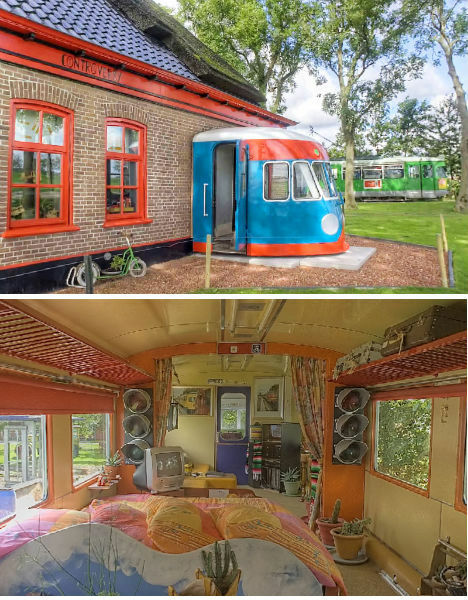 Bright and playful, these lodgings – found on a farm – are comprised of two reclaimed trams and a full-sized railway car that have been converted into six guest rooms packed full of fun recycled objects like a tire sink basin and a table made of traffic signs. It may be ‘cheap chic & no frills’, but the Qbic Hotel doesn’t skimp on style. This budget hotel in the heart of Amsterdam is high tech but low cost, and the earlier you book, the cheaper the rates. It’s a ‘pod’ hotel, but unlike other pod hotels like those in Japan, it features full-sized rooms – the ‘pod’ is a freestanding aluminum unit in the center of each room containing a double bed with a workspace/dining table at one end and a bathroom at the other. 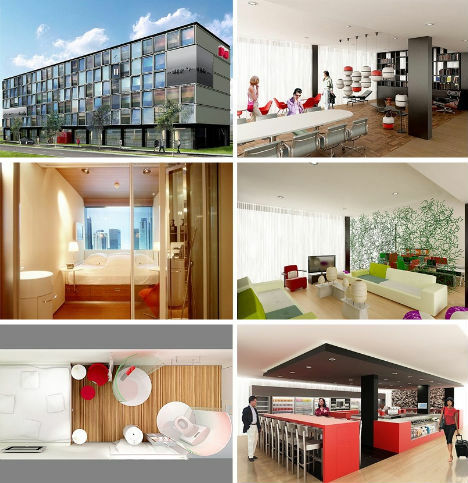 Citizen M opened at the Amsterdam airport in 2008 and represents another stylish addition to the city’s roster of impressively designed budget hotels. A new, even trendier location opened in Amsterdam proper in 2010, offering 215 modular rooms that fit as much function as possible into 150 square feet. A high-tech handheld ‘MoodPad’ controls the lighting, television, temperature and window blinds and the shower and toilet are contained within separate plexiglass tubes (so unless you’re an exhibitionist, stay with someone you know really well). Rotterdam’s Cube Houses are so cool-looking that residents were pestered by tourists hoping for a glimpse of the interior on a daily basis. Now, those same tourists can stay in the units themselves, as the houses have been transformed into a ‘Stayokay Hostel’. The hostel has both dorm-style and private rooms. With the tilted design of the cubes, nabbing one of the top rooms would definitely be a memorable experience. Is the De Vrouwe Van Stavoren every oenophile’s dream? The kind of wine lover that savors the smell of a full-bodied red wine would be in utter heaven at this unusual hotel made from salvaged wine casks. 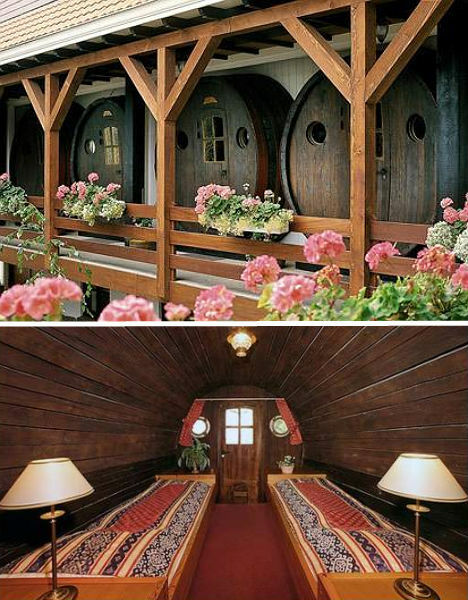 Each casks contains two narrow single-person beds, while an attached building contains the bathrooms. The small port town of Stavoren is located in the northern province of Friesland, which has its own language, and in the springtime its fields are abloom with infamous Dutch tulips. 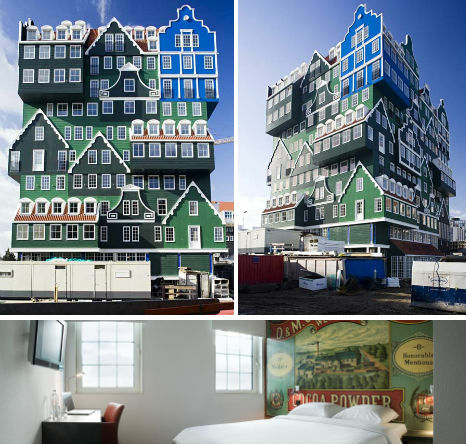 In a nod to the architecture of traditional houses in the region, Zaandam’s Inntel Hotel looks like a stack of homes with its overlapping green facades. The style of the ‘buildings’ featured in the facades ranges from a notary’s residence to a worker’s cottage. Eleven floors tall with 160 rooms, the Inntel features a swimming pool as well as a wellness center with a Finnish sauna and a Turkish bath. The stylish and budget-conscious ‘Hotel V’, as it’s known locally, is modern and minimalist but still cozy and warm. Each guest room is unique; design details include pebble stone bathroom walls and a rubber front desk . But perhaps the biggest draw to Hotel V is its central location, making it convenient to all of Amsterdam’s hottest spots. First a hotel for immigrants and then a prison, the Lloyd Hotel in Amsterdam now hosts guests of a different sort: travelers, of course. Famed Netherlands architecture firm MVRDV outfitted the interior of this historic building for its 2005 re-opening as a showcase of contemporary design. Each of the 116 rooms is so unique that they’re individually rated, from one to five stars. Naturally, the five-star rooms are where the Lloyd really shines. 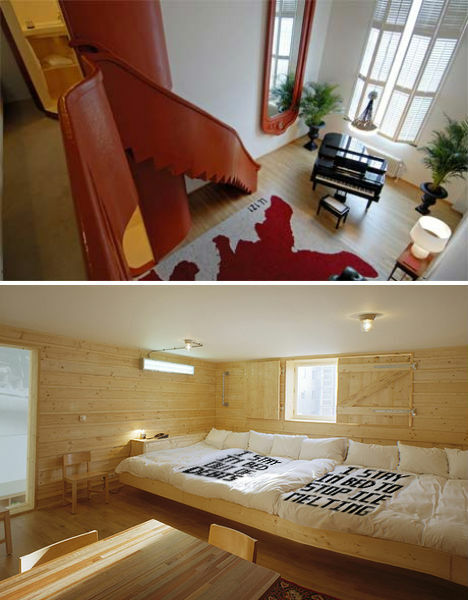 One room even has a bed for eight! 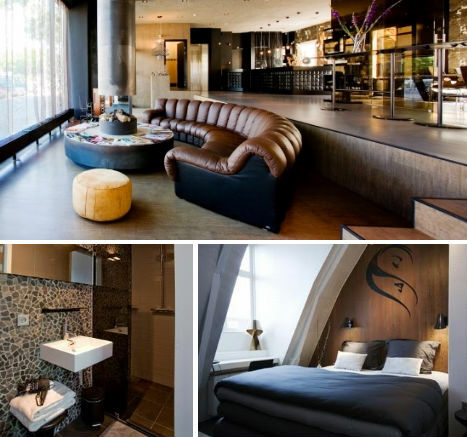 Often declared the most stylish hotel in Amsterdam, The Dylan is a converted 17th century theater with 40 individually designed rooms that come in five styles. Each theme – Kimono, Loft, Klassbol, Zensation Red and Zensation White, is elegant and understated with exposed beams and simple lines. It’s located right along the canal for a view that’s uniquely Amsterdam. 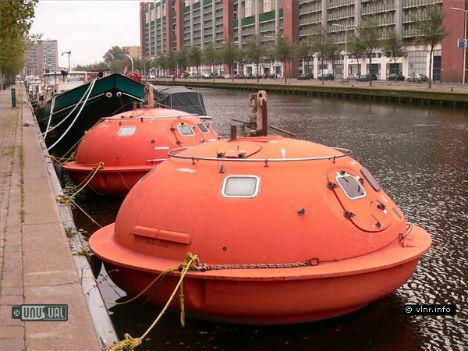 If a flood hits The Hague, you’ll be safe in one of these wacky ‘survival pods’. But of course, the off chance of a disaster is hardly the only reason to stay at the Capsule Hotel, which consists of a series of 12-foot bright-orange floating pods moored to a dock in the city center. Built for oil rigs in 1972, the capsules range from a super-simple one-person rig to a ‘luxury’ pod with sheepskins, champagne, a DVD player and a disco ball. Sounds like a party. 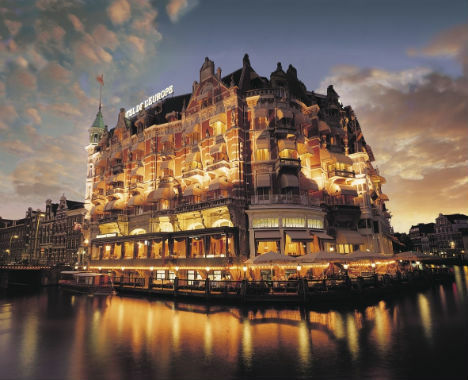 Hotel De l’Europe is a five-star hotel with an impressive history and a classic look, located on prime waterfront property just under a kilometer from big tourist attractions like the Anne Frank house. It’s dignified to the point of being, perhaps, a bit old-fashioned – but anyone who pines for old world Amsterdam may prefer it to the bustling boutique hotels that cater to hip crowds. It’s home to one of Amsterdam’s most exclusive restaurants, Excelsior, and recently expanded to include high-dollar specialty suites. When you step off one airplane, especially after a long international flight, perhaps the last thing you want to do is to embark upon yet another aircraft. 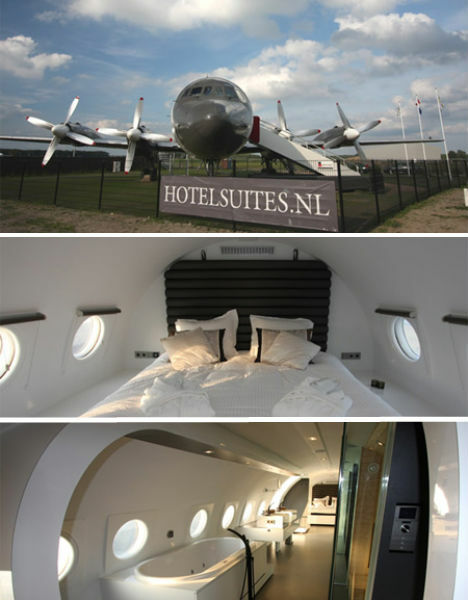 But for those who just can’t get enough of airplane interiors, the Airplane Hotel at the Teuge Airport is actually a pretty cool place to stay. The Cold War-era cockpit of this East German airplane has been preserved while the remainder was transformed into a modern guest suite with a kitchen. Sleeping in the bed at the tail of the plane and waking up to those little round windows will make you feel like you’re on a very pricey private jet.